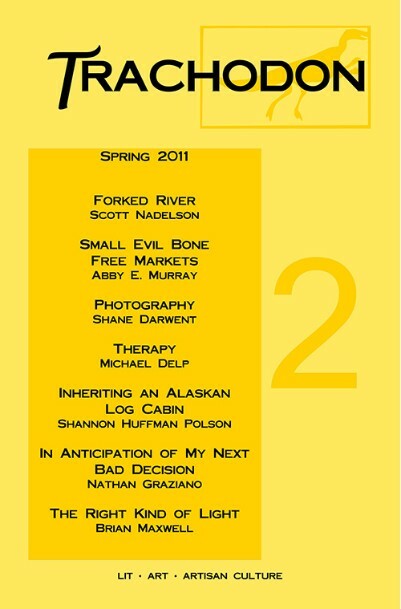 Trachodon 2 features literary writing by some of today's most engaging authors. In "Forked River," Oregon Book Award-winner Scott Nadelson takes us into the offices of the New Jersey state government, and into the heart of a lobbyist whose life is about to change; in "Therapy," Michael Delp explores the high cost of healing through a darkly humorous story; Brian Maxwell shows us the teeming Florida coast through the eyes of a naive but free-thinking young man; essayist Shannon Huffman Polson shows us the rewards and responsibilities of inheriting an Alaskan log cabin; Abby E. Murray contributes two poems "whose personal language is part of that richness we cannot do without" (Marvin Bell); and Nathan Graziano's poem "In Anticipation of My Next Bad Decision" delivers exactly what it promises. Also features black and white photography by Shane Darwent. Shannon Huffman Polson is a native Alaskan living with her husband and son between a home in Seattle and their cabin in Denali. Shannon contributed to More Than 85Broads, has published in Seattle Magazine, Alaska Magazine, and is working on a book about a 2006 trip to the Arctic. Visit www.aborderlife.com and www.theultimathule.org for more information. Nathan Graziano lives in Manchester, New Hampshire with his wife and two children. A high school English teacher, he recently completed his MFA at The University of New Hampshire. He is the author of After the Honeymoon (sunnyoutside, 2009), Teaching Metaphors (sunnyoutside, 2007), Not So Profound (Green Bean Press, 2004), Frostbite (GBP, 2002) and seven chapbooks of poetry and fiction. His work has appeared in Rattle, Night Train, Word Riot, Sententia, Freight Stories, The Coe Review, The Owen Wister Review, and others. For more information, visit his website: www.nathangraziano.com or blog: www.nathangraziano.blogspot.com. Brian Maxwell is a graduate student instructor at University of North Dakota, studying literature and creative writing. His stories have appeared in Fugue, Evansville Review, Beloit Fiction Journal, Silk Road, Permafrost, Louisville Review, Red Rock Review, and South Dakota Review. Recently, his work has been translated and will appear in the Italian anthology Empty Sockets, published by Intermezzo Press. Abby E. Murray has an MFA from Pacific University and currently teaches creative writing in Colorado Springs. Her poetry has been published in recent issues of War Literature & the Arts, CALYX, and Court Green, and her first chapbook (Me and Coyote) was selected for publication by Marvin Bell in the 2010 Lost Horse Press New Poets / Short Books series. She lives with her husband, two cats (Suvi and Lunchbox) and an unruly dog named Flynn. Her website is www.abbyemurray.com, with the poetry link www.abbyemurray.blogspot.com. Shane Darwent was born in Austin, TX and raised in Charleston, SC. He attended Maryland Institute College of Art in Baltimore where he received his BFA in printmaking and photography. Darwent currently lives in Chattanooga, TN where he is a photographer, sculptor, and freelance woodworker. Follow Shane's adventures on his blog, www.blackcameracrusades.blogspot.com.